This incisive study of 1 Corinthians 12-14 and other passages about "spiritual gifts" gets to the core of Paul's message about the Spirit-empowered life. Carson's careful exegesis considers differences of opinion, and makes helpful pastoral applications. 342 pages, from Authentic. - Publisher This volume is an intelligent and definitive grappling with a passage that focuses upon spiritual gifts: 1 Corinthians 12-14. Carson shares pastoral insights about preserving church unity in the face of controversy over such things as charismatic teaching and practice. Partisans on both sides of charismatic issues are challenged by the even-handed consideration of nuances in the Greek text in these three crucial chapters. 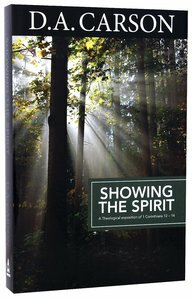 About "Showing the Spirit: A Theological Exposition of 1 Corinthians 12-14 (Carson Classics Series)"
This volume is an intelligent and definitive grappling with a passage that focuses upon spiritual gifts: 1 Corinthians 12-14. Carson shares pastoral insights about preserving church unity in the face of controversy over such things as charismatic teaching and practice. Partisans on both sides of charismatic issues are challenged by the even-handed consideration of nuances in the Greek text in these three crucial chapters.